A license is a contract that authorizes a licensee to make use of software or an intellectual property, according to the terms set forth in the license. At all times, the licensor maintains title in the property. The license should be in writing and should clearly set forth the terms under which the rights are granted. There are many ways to structure the consideration for a license of software or an intellectual property. Typical payment schemes include a fixed payment; periodic payments; a royalty based on the number of users, computers or locations; or a combination of fixed payments and periodic royalty payments. There may be a floor or ceiling on royalty payments. Licensors may determine fees for site and entity licenses based upon the current size, processing needs and reasonable growth projections of the licensee. Consider the duration of the license. A license can be perpetual or for a fixed term. A license may expire after a specified number of years, and if the customer wishes to continue the license after expiration of the term, the licensee can renew upon payment of a new license fee. The license may provide for termination if the licensee fails to pay royalties or license fees. Subject Matter – What is being licensed? Territory – Is the scope of the license regional, countrywide or worldwide? Quality Control – How will the inventor control the quality of the product sold by the licensee? Channels of Trade – Where can the product be sold? Exclusivity – Will the license be exclusive or non-exclusive? Royalties – How will the inventor be paid? - Other payment mechanisms could include flat fees, minimum guarantees, advances against royalties, or graduated royalties. Be careful of gross v. net sales. Promotional and/or Commercialization Efforts – What efforts must the licensee undertake to promote or commercialize the invention? Improvements – Who will own improvements to the invention? Acknowledgement of Rights – Does the inventor want the licensee to acknowledge the inventor’s rights? Representations and Warranties – What assurances will the licensee want about the licensed product? - A common representation or warranty by the inventor is non-infringement. Stipulated Injunction – Is the inventor entitled to an injunction if the licensee steals the invention? Infringement Notification – Do the parties have to let each other know about infringing activity by third parties? Insurance – Is a party required to insure the other if something goes wrong with the product? Sublicensing – Can the licensee sublicense its rights to another party? Confidentiality – Do the parties want the license terms to be secret? Indemnity – When is one party required to pay for the other’s legal costs? Accounting Provisions – Under what circumstances does the inventor get to look at the licensee’s sales records? Assignability – Can the inventor or licensee assign their rights or obligations to a third party? Dispute Resolution – Are the parties required to resolve their disputes by mediation or arbitration? Governing Law – What law will control if there is a dispute about the agreement? Where does a lawsuit have to be filed? Amendments – Under what circumstances can the license be changed? Disclaimer of Warranties – Do the parties disclaim any express or implied warranties? Termination – When can the license end before the contract term expires? Term – How long will the agreement last? This is not an exhaustive list. 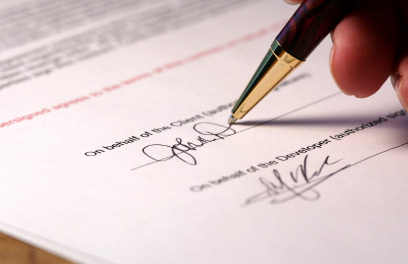 Licenses tend to be complex legal documents and they come in a variety of forms. This checklist is not, and should not be construed as, legal advice. Remember: Most everything is negotiable!